La Marmite, has been completely renovated to become a mountain restaurant, synonymous with terroir and quality. That is why we have an eco-responsible approach, and we choose the most local and Savoyard materials if not French as possible. We are also in a quality approach in perfect harmony with Christian our Chef and everything is cooked HOME by our beautiful kitchen team. An approach of "Maitre Restaurateur" is also, in course also, to unhook this very nice Label of good French tables. This property is located in Les Menuires in the Les Bruyères area and is the ideal place for a relaxing family holiday. At the start of the Bellevue gondola, the restaurant can accommodate 200 people on the terrace and 150 inside. In a warm and elegant setting, a dynamic and very welcoming team will offer traditional homemade cuisine, complemented by the mountain specialties, ... .. enough to satisfy all whims. 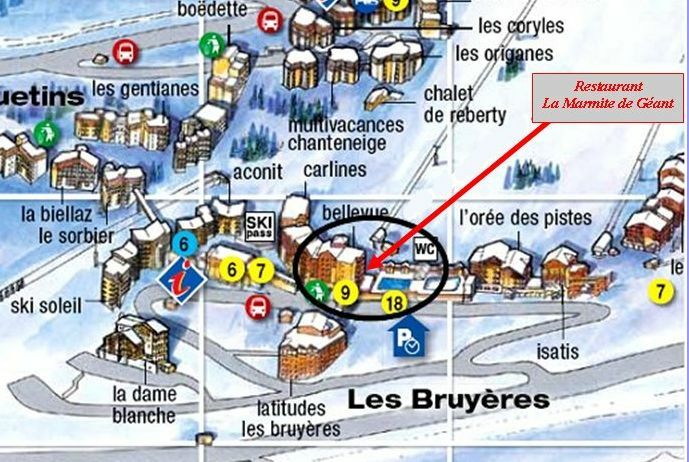 The terrace of La Marmite is accessible to skiing, making it a strategic place for your lunch break. You will spend a moment of conviviality around a wide choice of formulas, dishes of the day, meats prepared with delicacy. Contact details : La Marmite. - 200-seater terrace with panoramic views. - Large interior room very "cocooning". - Selection of local products. - Great wines and rare grape varieties.